Do you need to fireproof your home? Here are some basic first steps to take. Protecting the investment that you’ve made in your home and protecting the health and safety of your family are probably two of your biggest priorities. 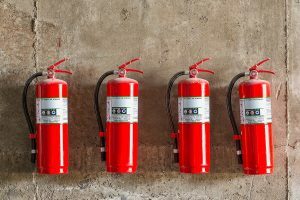 While accidents and disasters can strike at any moment, putting a little bit of effort into fireproofing your home can prevent the worst from occurring. Here are five simple ways to fireproof your home. Fire extinguishers are your first and best defense against a small fire. You should always keep a fire extinguisher in your kitchen and any other areas of the home with flammable materials, including basements and garages. Without a fire extinguisher, fires in these areas can grow rapidly with the amount of fuel and oxygen present. Always keep your fire extinguishers up to date, or they will not help to fireproof your home at all! Every home should have multiple smoke detectors installed. These are often the first warning that you will receive in the event of a fire. While it is great to have smoke detectors installed, keeping them working is even more important. Always test your smoke detectors every 3-4 months and replace the batteries as needed. While there is no such thing as 100% fireproof carpeting, many carpets today are produced with fire-resistant capabilities. These carpets are available in the same wide range of colors and patterns that homeowners expect, so it won’t feel like settling. If you have smaller rugs in your home, consider treating them with a fireproof chemical to prevent ignition. Thanks to all of the modern technology devices many homeowners keep plugged in around the clock, electrical short circuits have remained one of the most common causes of house fires. Any devices in your home that draw a large amount of electricity should be installed with the help of an electrician. Never overload your wiring and make sure that plugs fit snugly into outlets. Loose fitting plugs can spark and heat, creating a fire hazard. Every home has a pile of junk mail on the kitchen table and a few old magazines strewn about—that’s fine! However, if you have a good deal of accumulated paper or flammable materials around your home, it’s time to clean up. Clean out your attic or basement at least once a year so that you can limit the amount of flammable materials lurking around your home. This entry was posted on Friday, August 18th, 2017 at 10:15 am. Both comments and pings are currently closed.